Why do a few great companies soar to peak performance while others find only internal obstacles and disappointing limits to its success? Is it just the sheer luck of being in the right place at the right time? Is it ingenious product development, skilled engineering, savvy marketing, or superb leadership? On their own, technological and operational improvements will fall short of the mark unless carried out by fully engaged people sharing a common vision, focusing energy and resources on critical business goals. It is definitely a good measure of all of these. But, other less obvious, perhaps more fundamental, conditions can lead to sustainable success. Through the efforts of people working together, successful companies know and serve customers better than anyone else. This collaboration guides everything day after day. The key is in how effectively people are integrated with the right technologies and the best processes. Focus the Vision. In an environment of increasing competition and rising customer expectations, all organizational energy and resources must be focused on defined business goals. 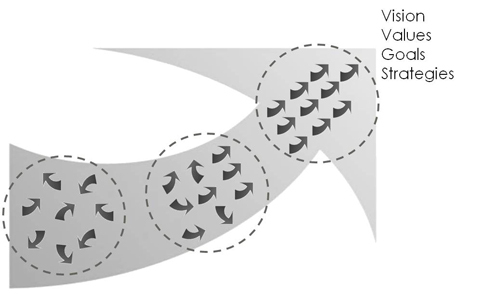 Leadership must identify and clarify key business strategy and expected outcomes, communicating this vision throughout the organization. Align Action. Each initiative and leadership behavior must be aligned to avoid wasteful internal competition and fragmentation that can be devastating to tight margins and schedules. At every level of the organization, action plans and achievable, measurable targets must be set and resources allocated to achieve the vision. Aligned action defines, drives, and supports key behaviors to produce results. Additionally, proven processes and technological solutions are allocated and aligned to support these key actions. Engage People. Focus and alignment are not enough to command a sustained level of excellence. Everyone throughout the organization must be fully engaged on a daily basis – hands, heads, and hearts committed to the achievement of knowing and serving customers. Everyone’s daily work is connected to key business goals through clear measurement and a commitment to continuous improvement. Every employee understands the goals, what happens if the goals are not met, and what is in it for them individually. Employees are empowered within clear boundaries to make the changes necessary in their work process to get results. Excel to Success. 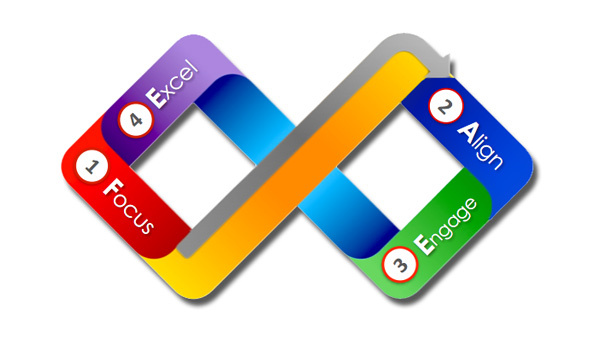 Focus, alignment, and engagement drive sustained business excellence. People want to be part of a winning team. Make intentions clear, assure aligned leadership behaviors, and give people the power to remove roadblocks in their own work. People will excel far beyond your expectations and achieve their full potential. Clear goals, valid measurement, and regular feedback guide this approach. Feedback is expected. Celebration is frequent. Change is the norm. Intentions are clear and behavior is kept in balance with those intentions. Great companies have several things in common. Great companies start with a clear vision of where the company should be, keeping in mind the needs of customers, stockholders, and employees. Great companies develop the goals and strategies that will get them to that vision, connecting the goals and strategies to the daily work of the company. Great companies engage employees in the vision and actions required to deliver results. These successful companies focus the vision, align actions, processes, and technology, and engage people to deliver sustained excellence.